Victorian Railways 6 wheel wooden sleeping carriage, with an elliptical roof and a composite wood steel body with flush steel external panelling. Built in 1928 at Newport for use on the Adelaide and Mildura lines. These steel sheathed cars were 3 inches wider than earlier cars constructed for The Overland, being 9 feet 9 inch wide. 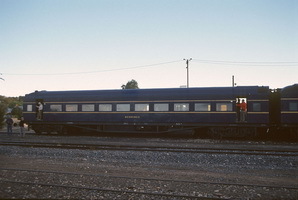 The provision of a tenth two berth cabin occupied the area used as the smoking saloon in the earlier cars. A weight of 43 tons 4 cwt., was recorded. All other dimensions, except the height from the rail to the top of the roof, which was reduced to 13 feet 3 inch were identical with the V&SAR Joint Stock Sleepers. A feature of the modified cars was the unequal length of the end vestibules. The one at the end where the tenth sleeping cabin, smoking saloon end of the standard cars, was 1 feet 9 inch longer than the other being 9 feet 5¼ inch long. Werribee was fitted with air conditioning in 1937. To accomodate the gearbox drive of the air conditioning equipment a heavier fabricated bogie of a generally similar design was provided for the rebuilt sleeper. 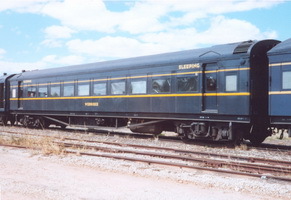 It was also recorded Sleeping car No.1 (name removed) and painted blue. In 1969 it was damaged by fire at Irymple when the down Mildura sleeping car train struck a loaded petrol tanker at a level crossing. It was taken to Newport for repairs. 5.7.1937 Fitted with air conditioning. - Recorded Sleeping car No.1 (name removed) and painted blue. 1.5.1969 Damaged by fire at Irymple when the down Mildura sleeping car train struck a loaded petrol tanker at a level crossing. 11.8.1989 To Newport for storage. 30.8.1990 Transferred to SteamRail (Vic). - Painted and renamed back to Werribee.